A master teacher knows that educating young people is not a matter of what you do TO them, but is something you ignite IN them. To be aware of the right moment and spark their interest, curiosity and enthusiasm on any given day requires a vision for what each child could be and an understanding of who they are at that moment. At Hillsboro Parent Preschool, we have such a teacher in Penny Berrien. 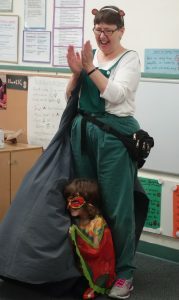 She is the spark that brings the parents and children of our co-op preschool together to form a community of learners; parents and children alike. In August of 2004, I hit a lottery of sorts; I was lucky enough to snag an open spot at HPP for my son. What I didn’t know then was that it would be just as much of an education for me, as a parent, as it would be for my son. Teacher Penny has given me and the other parents of our school the gift of understanding and supporting not only our own children, but all children in the community at large. She has taught me how to observe and respect what children are capable of; to know when to offer support and when to let them make their own discoveries. She has freely given us the gift of being able to relax a little and enjoy the fleeting moments of early childhood. Our children adore this woman with all their heart. Why not? Unlike many of the teachers when I was in school, she lets the kids in on the fact that she is a whole person, with a life, interests and her own family. This makes her even more of a hot commodity with our children. We take a field trip to her house so the kids get a real understanding of her as someone who exists outside of the classroom. The highlight of this field trip is her exotic musical instrument collection where each child gets a chance to try the instruments and the finale is a cacophony of joy! Penny is also sharing her love of nature and science with us and our children. On a field trip to a local nature park, we see a banana slug up close and personal as Penny picks up the slug – while we parents recoil and try to hide our shudders, the children dive in for a closer look. She models her love and respect for nature to the children and reminds them to leave the area as we find it; natural and pristine. As parents, we now know that we are obligated to bring to class any natural treasure – dead or alive. Walking sticks, dead mice, or raccoon skulls; all are much more interesting when Teacher Penny gets her hands on them. During the same field trip, as the children cross a small footbridge, she suggests an impromptu performance of the Three Billy Goats Gruff, with a parent acting as the troll (a role we will more than likely reprise during our children’s teenage years). These everyday preschool experiences are welcome reminders that play is a child’s work, and should be parent’s work as well. 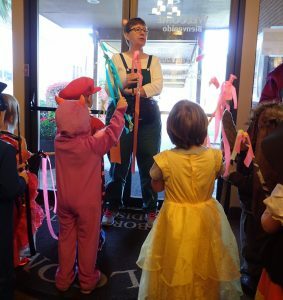 Hillsboro Parent Preschool is different from what I imagined preschool to be, and vastly different from the types of preschools several of my friends and family sent their children to. Before I knew of HPP, I wasn’t excited about sending my then three year old off to a school and just dropping him at the door. Much to my relief, life as a co-op parent is much more exciting and enriching than merely sharing carpool duties or providing snack for the class. We are in class, working alongside our master teacher, treated as peers and partners on this journey, not merely as an extra set of hands. We are right in the middle of the action when a child makes surprising developmental leaps; sometimes it is our kid making those amazing leaps, and sometimes it is the child of a friend – because that is what parents become – friends. I feel tremendously blessed that my son’s first educational experience has been so positive and joyful. Because of this he has requested a third year at preschool in lieu of kindergarten . He simply can’t imagine school without her. Truthfully, neither can I. Penny has built a foundation, and an excitement for learning, that will serve my son well in later years. Being in the classroom with Penny has shown me what a phenomenal educational experience feels like, as well as what someone who is a gifted teacher looks like. Penny has been a teacher at HPP for over 15 years, and before that she was an active parent at HPP with her young children. Previous to her work at HPP, she was a kindergarten teacher in the Portland Public School District. She has a Master of Arts in Teaching from Lewis and Clark, but her personal quest for lifelong learning continues. In addition to being active in many professional teacher organizations, the Oregon Association for the Education of Young Children (OAEYC) and having held several board positions over the years for Parent Child Preschools of Oregon (PCPO), she is studying the educational theories of the preschools of Reggio Emilia, Italy. At HPP, teacher Penny has created a safe, stimulating, welcoming and developmentally appropriate preschool environment for our children. She does this daily with a smile on her face and a warm welcome and hug for all of our children. It is a place where parents can trust our children will not simply be cared for, but also cared about; and it is a trust built out of common experience and love of our teacher and our school. She is the magnetic center of our school, and for that we are grateful. She has set the bar very high for the future teachers of our children.